The second great Greek civilisation was Sparta, with its unique society and culture. In the second pair of biographies in his Parallel Lives, Plutarch tackles that of the founding father of Spartan law and culture. In doing so, he provides one of the best sources of information about both Lycurgus and the society which he built. However, he warns us at the outset that almost everything claimed of Lycurgus is the subject of dispute. Lycurgus was born into a Spartan family, although quite which is unclear. It is most probable that he was the son of a reigning king of Sparta, who lost his life when he was stabbed with a butcher’s knife as he intervened in a riot. Lycurgus’ older brother Polydectes inherited the throne, but died shortly afterwards. Polydectes’ wife was pregnant at the time, so Lycurgus could only reign until that child was born: if a boy, then Polydectes’ child would succeed to the throne. After eight months of Lycurgus’ rule, a son Charilaüs was born, and Lycurgus proclaimed him king. To allay suspicion that he might try to usurp the authority of the new king, Lycurgus left Sparta and travelled. This gave him the opportunity to visit other kingdoms to learn of the strengths and weaknesses of the laws and institutions of Crete, the Ionians, and Egypt. Lycurgus resolved to revolutionise Spartan society by introducing a completely new regime. He therefore visited the oracle at Delphi to discover whether his ideas were sound. Eugène Delacroix’s Lycurgus Consulting the Pythia (1835-45) shows Lycurgus with Pythia, the high priestess at Delphi, who is here listening intently to Lycurgus as he describes his proposals, before giving her verdict on them. 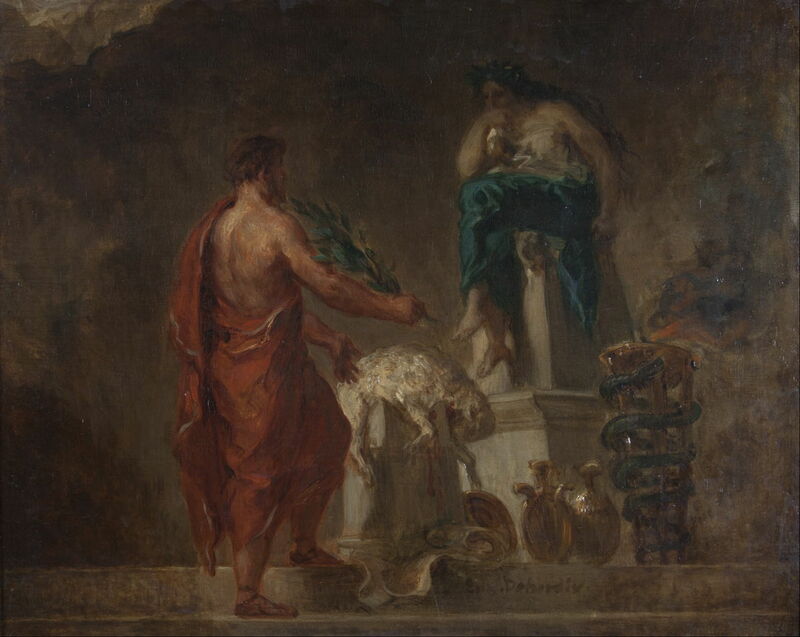 The high priestess addressed Lycurgus as “beloved of the gods, and rather god than man”, and endorsed his proposals, which she said would be the best in the world. Lycurgus’ next task was to win the senior Spartans over, so that they would be happy to implement his laws. Once he had convinced many of them, Lycurgus got thirty of those chiefs to go into the marketplace at dawn, and with their weapons to strike terror into those who opposed the proposals. King Charilaüs fled to a refuge, but then returned and gave Lycurgus his support. The changes made to Spartan law, institutions, and society were fundamental and extensive. Lycurgus established a Council of Elders with twenty-eight senators, to ensure that no king could become tyrannical, and the state couldn’t drift towards democracy. Land was redistributed uniformly and equally in lots: 30,000 in Laconia, and 9,000 in the city of Sparta. Lycurgus withdrew all gold and silver coinage, leaving only iron in circulation. He then devalued that currency, so that being rich in it would require a large store-room full of heavy iron coins. This forced equality in terms of money and possessions, and helped banish superfluous arts and trades, making luxury die away. To ensure a communal life for the good of society as a whole, he introduced common messing, so that Spartans all ate in large groups, on a simple but healthy diet. Wealthy Spartans grew incensed with these changes, and started to stone Lycurgus, who was forced to flee from the marketplace. However, one young Spartan, Alcander, managed to blind him in one eye before he reached safety. Rather than have Alcander put to death, Lycurgus took him in as a servant and companion, so that the young man became his most devoted follower, and convinced other opponents to support the reforms. Plutarch then provides considerable detail of the diet provided by these common messes, and the fact that Spartan boys attended them, and there learned to withstand others jesting at them. Lycurgus didn’t put these laws into writing, but established an educational system which would instill them into future generations. Other unwritten laws included the requirement for all laws to remain unwritten, and the avoidance of extravagance in property, by the use of common building materials and standards. Caesar van Everdingen (1616/1617–1678), Lycurgus Demonstrates the Benefits of Education (1660-62), oil on canvas, 167 x 219 cm, Stedelijk Museum Alkmaar, Alkmaar, The Netherlands. Wikimedia Commons. The narrative in Caesar van Everdingen’s Lycurgus Demonstrates the Benefits of Education from 1660-62 doesn’t appear to relate directly to Plutarch’s text, but shows a young Lycurgus with a couple of young Spartan men, their hair cropped short. The new law also regulated marriages and births. As Spartan men were away on military expeditions much of the time, Lycurgus gave their wives sole control when their husbands were away, and the title of Mistress. He ensured that unmarried Spartan women kept healthy, by prescribing that they undertook running, wrestling, throwing the discus, and the javelin. 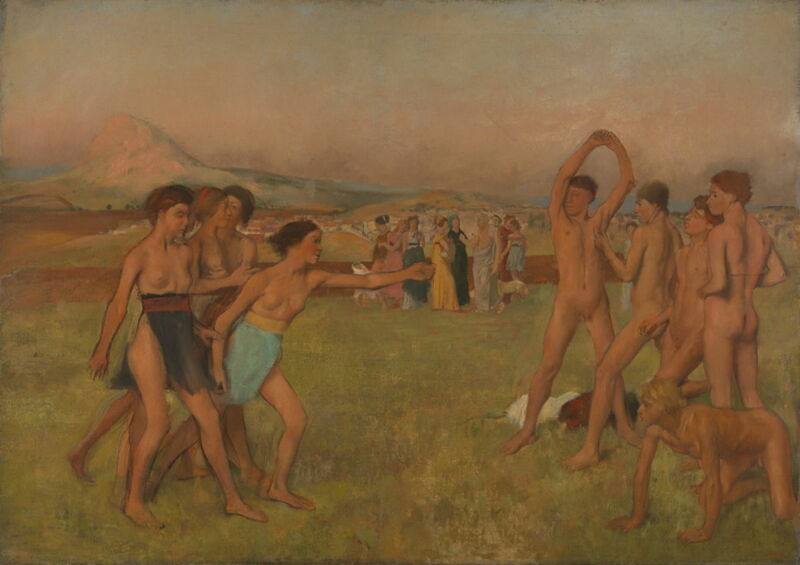 Edgar Degas’ famous painting of Young Spartans Exercising from about 1860 includes two important details in its background: Mount Taygetus, at the left behind the group of girls, and at its centre a group of women talking with a man wearing white robes. Mount Taygetus was the place where the feeble babies born to Spartan families were abandoned, so as to ensure that the only children who survived were those who would make the best elite warriors or mothers, according to their gender. The old man in the white robes is Lycurgus himself, who is here talking with the mothers of the young Spartans in the foreground. He freed them from softness and delicacy and all effeminacy by accustoming the maidens no less than the youths to wear tunics only in processions, and at certain festivals to dance and sing when the young men were present as spectators. There they sometimes even mocked and railed good-naturedly at any youth who had misbehaved himself; and again they would sing the praises of those who had shown themselves worthy, and so inspire the young men with great ambition and ardour. For he who was thus extolled for his valour and held in honour among the maidens, went away exalted by their praises; while the sting of their playful raillery was no less sharp than that of serious admonitions, especially as the kings and senators, together with the rest of the citizens, were all present at the spectacle. Marriages became open, in allowing both husband and wife to have relations with the partners of others. Sons were considered not to be ‘owned’ by their fathers, but by the state itself. Newborn infants were taken to a place called Lesche, where they were examined by elders, who decided whether the child was healthy and sturdy. If it was, it was assigned one of the 9,000 plots of land, and reared by its parents. Babies deemed frail or ill-formed were abandoned at Apothetae, a chasm at the foot of Mount Taygetus, to die. 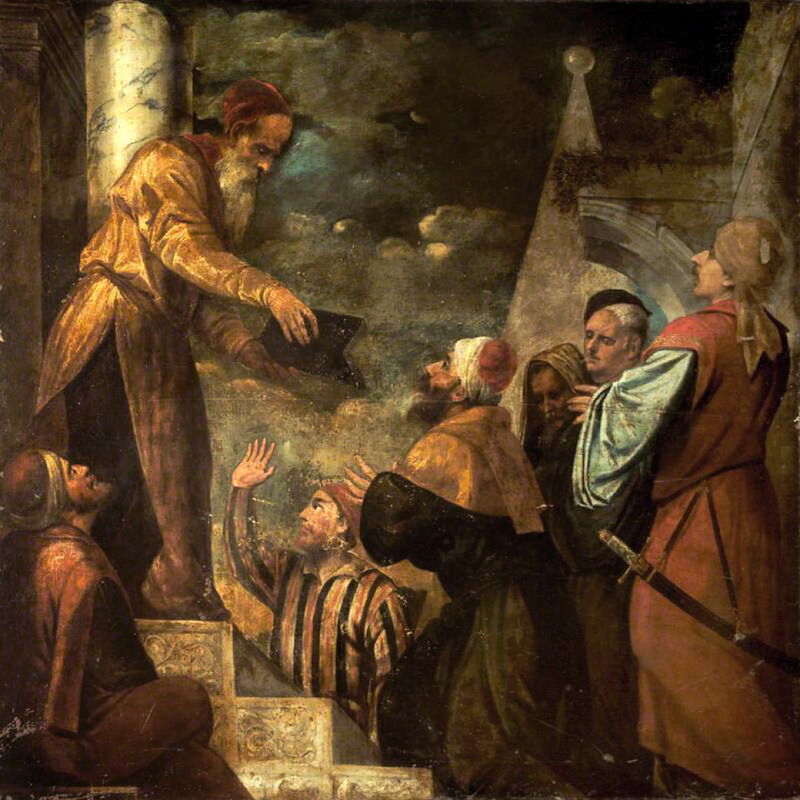 The examination by elders at Lesche is the subject of two little-known paintings which appear to have a common origin. The first, claimed to be by Jacques-Louis David and titled Lycurgus of Sparta (1791), shows this process taking place, with a queue of young parents. A newly-born infant is being presented to the elders for their verdict, perhaps with Lycurgus acting as the organiser. Jacques-Louis David (1748–1825), Lycurgus of Sparta (1791), oil on canvas, dimensions not known, Musée des Beaux-Arts, Blois, France. Wikimedia Commons. 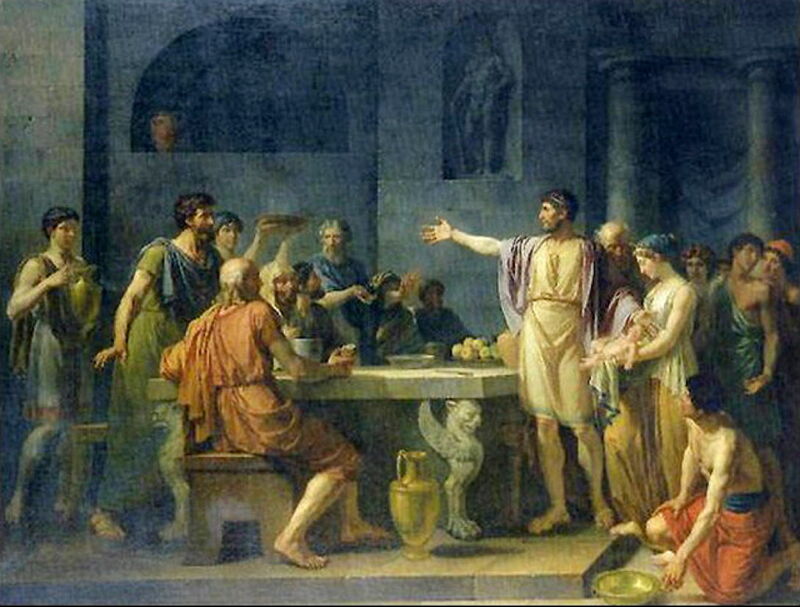 Jean-Jacques-François Le Barbier (1738–1826), The Magnanimity of Lycurgus (1791), oil on canvas, 131 x 170.9 cm, location not known. Wikimedia Commons. This painting by Jean-Jacques-François Le Barbier is titled The Magnanimity of Lycurgus and was apparently made in the same year of 1791. I apologise for its poor image quality. All its key elements correspond to those in the David, as if one artist partly copied the other. [Lycurgus] trained his fellow-citizens to have neither the wish nor the ability to live for themselves; but like bees they were to make themselves always integral parts of the whole community, clustering together about their leader, almost beside themselves with enthusiasm and noble ambition, and to belong wholly to their country. When these laws were all in place and in practice, Lycurgus told an assembly of all Spartans that he needed to return to the oracle at Delphi to consult on one final measure. He made the Spartans take an oath to abide by these unwritten laws until his return, then departed for Delphi. There he obtained the approval of the oracle, which he recorded in writing and sent back to Sparta. Jacopo Palma il Vecchio (c 1480-1528) or Bonifazio Veronese (1487-1553), Lycurgus Gives the Laws to the Spartans (date not known), oil on canvas, 209.5 x 209.5 cm, location not known. Wikimedia Commons. This undated painting of Lycurgus Gives the Laws to the Spartans has been attributed to either Jacopo Palma il Vecchio (c 1480-1528) or Bonifazio Veronese (1487-1553). 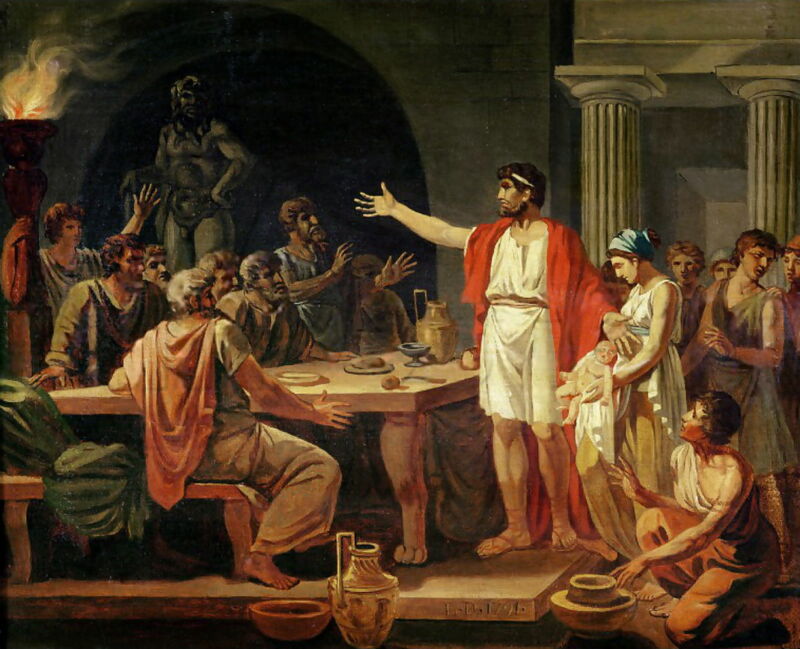 It shows an elderly Lycurgus apparently giving a volume of written law to the Spartans in the marketplace, but could equally be of Lycurgus addressing his last assembly of all Spartans before he left for his second visit to Delphi. 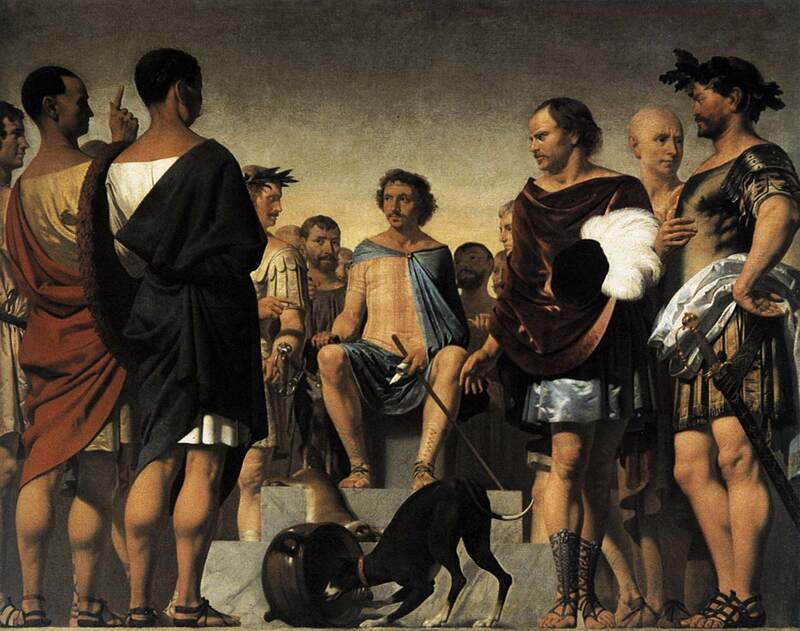 Merry-Joseph Blondel (1781–1853), Lycurgus of Sparta (1828), oil, dimensions not known, Musée de Picardie, Amiens, France. Wikimedia Commons. Merry-Joseph Blondel’s portrait of Lycurgus of Sparta from 1828 also shows him as an older man, here with written scrolls on his right thigh. Given the oral nature of Lycurgus’ laws, this can only be interpreted as the moment that Lycurgus has written his message reporting the oracle’s approval of his laws, ready to send it back to the city. 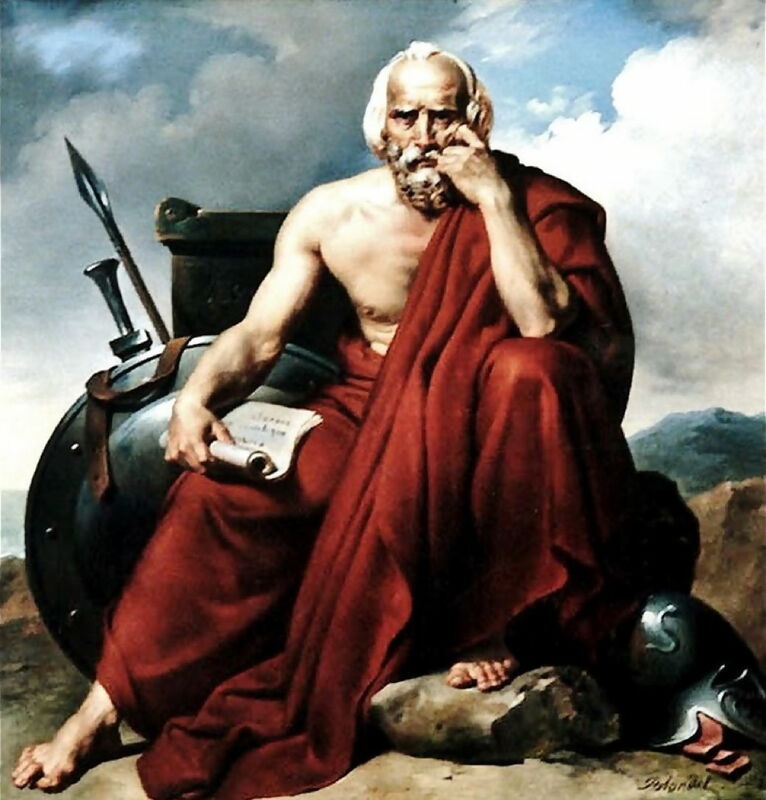 Lycurgus then did something extraordinary in its selfless ingenuity: having put the whole of Sparta under oath to keep his laws until his return, he then starved himself to death, ensuring that that oath could never expire. The laws of Lycurgus lasted through fourteen kings, and five hundred years, without change, until gold and other spoils of war entered Sparta during the reign of King Agis. Posted in General, Life, Painting and tagged biography, Blondel, David, Degas, Delacroix, history, Le Barbier, morality, painting, Plutarch, van Everdingen. Bookmark the permalink.